Website attacks and cyber attacks are growing in numbers every day and the importance of creating a secure website and website security, in general, is increasing rapidly. So, being secure in the online world becomes more and more important every day and it is more than important to protect your website and the data it holds now. So, therefore, we’ll give you five reasons why website security is important. Did you know – 56% of all internet traffic is from an automated source such as hacking tools, scrapers and spammers, impersonators, and bots. So you might think – is my website secure? You can secure your website with WebARX next generation website security platform and advanced firewall already today – try our 14-day free trial. PS! If you need a bit more time copy this code m9l5h8f5 to the billing section coupon code field in the portal and get one free month on us. Well, but now let’s dig into why website security is important. Malicious software is used to infect websites, gather data and in some cases even hijack computer resources. A site where an attacker has gained an access to can be used to redirect traffic and infect visitors with the malicious software. There are thousands of different types of malware and thousands of different ways to infect your website, which is mostly all done by automated hacking tools. Your website has been hacked or defaced or blacklisted? Need a malware removal? Sign up and check what is going on on your site. What they all have in common, is that the hacked websites are mostly used to retarget your potential customers, your website visitors. Botnet-enabled attacks on vulnerable Web applications, in fact, accounted for more breaches (571) than any other vector in Verizon’s 2017 Data Breach Investigations Report. In March 2016 Google announced that more than 50 million websites worldwide are infected or malicious. In March 2015, that number was 17 million. The number of new Web application vulnerabilities published in 2017 was 212% greater than the number disclosed in 2016. 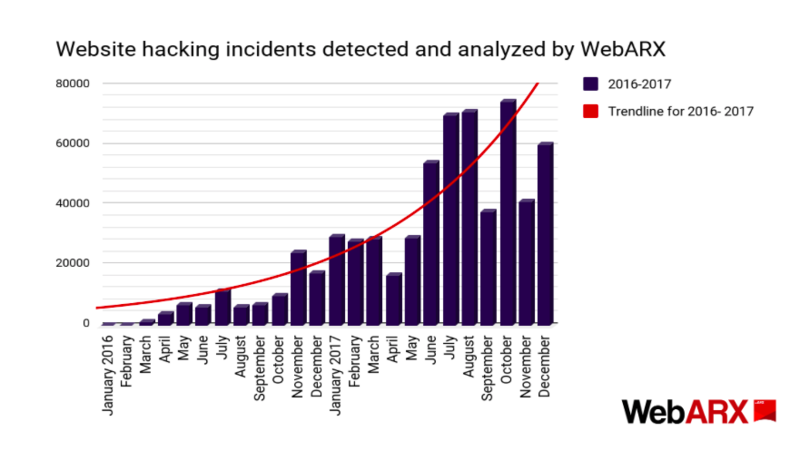 WebARX data also has shown a great rise of hacked sites. We detected 95 787 hacked sites in 2016. In 2017 that number was almost six times higher – 547 729. In 2018 Google has sent over 45 million notifications to registered website owners through Search Console, alerting them to possible problems with their websites which could affect their appearance in a search. Also, they sent 6 million manual action messages to webmasters about practices that we’re against Google’s guidelines, along with information on how to resolve the issues. And Google took action on nearly 90,000 user reports of search spam. There are over 1,3 billion websites on the world wide web today and people rely on search engines when they want to reach information on those sites. Therefore search engine optimization is more important than ever and it is necessary for every webmaster to understand the true meaning of SEO as well as the potential it can provide for every business. Google and other search engines (for who you typically don’t want to be on the naughty list) warn your customers and restrict them from entering your website. Lately, Google, for example, has stepped up the game even more. Starting from July 2018, every website without SSL (HTTPS) will be marked as insecure and therefore receive an SEO penalty, which makes it harder for your company to reach to new customers. But the reality is that, because of a hacked website, a customer loses trust and therefore it will lead to company reputation loss, which for e-commerce can often mean an end of the business. When talking about website security and CMS security the infections are also rising actively. For example, WordPress continues to be the leading infected website CMS. On average, about 30 000 websites get hacked every day and in reality, the majority of these 30,000 sites are legitimate small businesses that are unwittingly distributing malicious code for the cybercriminals. When your site is hacked and added to different blacklists, the potential customer cannot reach to the products or services being offered. As a website owner discovering that your website has been hacked, the first thing to do is to search “How to clean up a hacked site”. Yes, you will find a lot of blog posts and articles about it, but they will all eventually recommend you the same thing – have a professional to do it for you. Performing a WordPress malware removal in a way that you can be sure that it’s clean is not an easy task. That’s why a service like this can cost over 150 dollars per site and even then, depending on the service provider, you can’t be sure if the site was properly cleaned or not. The latest research by Acunetix reveals that around 84% of websites contain vulnerabilities, which means all of them are prone to be infected at any time. The process of a malware clean-up of a website is much more about knowing the vulnerabilities and knowing the way of a hacker mind, than just manually going through the files. Malware is often hidden from the original files and to the database and attackers put a lot of effort into making sure you won’t be able to remove their backdoors so easily. It’s expensive, indeed. Not just the malware clean-up service itself, but the lost revenue and reputational damage are what can eat up a lot of time and money to recover from. If your site has been hacked before you were even thinking about website security, see this: Comprehensive WordPress Malware Removal Guide if you think you are up to removing the malware by yourself. Usually, a website gets blacklisted when it contains something harmful to the user, for example, malware. Here you can learn how to secure your WordPress site under 3 minutes.